Most of the aspirants have been participating for the banking exams and government jobs and upcoming examinations. For those people we thought of helping some daily GK Current affairs of 20th August 2018. These Current affairs will boost up your mind and improve your preparation levels. 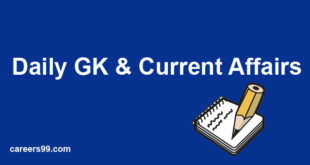 This Current affair consists of many expected questions along with the answers which connected to the exam paper for the upcoming bank exams and so on. People please try to attempt all bits correctly. 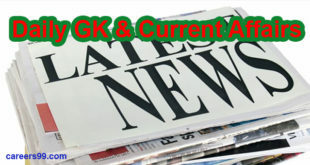 You can also check the yesterdays daily GK Current Affairs from this website. 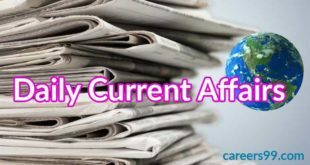 Careers99 guides and provides the Daily GK Current affairs of 20th August 2018. She was called the PM of Maruitius Paravind Kumar Jagnauth after discussed and depending between two nations. Anti-Tank Guided Missile named ‘HELINA’ from Pokhran was tested successfully by Indians. Guided bombs Smart Anti Airfield Weapon (SAAW) was also successfully flight tested in Jaisalmer Rajasthan. All India Cotton Conference was held in Bathinda. The conference was organised by Indian Cotton Federation and Indian Cotton Association, Bathinda. The Food Safety and Standards Authority of India (FSSAI)constituted a group of experts from the health and nutrition sector to look into the issue of food labelling. The expert panel will be headed by B Sesikeran. Mr Sesikeran is theformer director of National Institute of Nutrition (NIN) and comprises Hemalatha and Dr Nikhil Tandon. Novak Djokovicbeat Roger Federer 6-4 6-4 to win the Cincinnati Masters and become the first man to complete a career sweep of all nine 1000 Series titles. Gopalkrishna Gandhi is declared as the winner of Rajiv Gandhi Sadbhavana Award-2018. This is the 24th edition of Sadhavana Award. World Photography Day was observed on 19th August. The aim is to inspire photographers across the planet to share single photo with world. The deal worth $3.2 billion. Soda Stream is Israel-based at-home carbonated drink-maker.